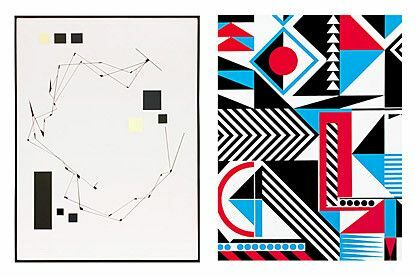 Laura Mars Gallery is looking forward to the two solo shows on its premises by Berlin-based artists Frank Maier and DAG. At a glance, both artists’ works seem quite akin – as though they were speaking the same language. At closer inspection, however, their approaches do differ quite considerably. DAG’s pictures unfold their fascination between the poles of abstraction and concretion, as well as of closeness and distance. With him the morphogenesis is an open process which may, always depending on occasion and local challenge, seek its direction one time as a panel, another time as the color-form gradient of a mural. He ushers his audience across generously and variously designed structural fields. From tinyness to monumentality, from plane into space. From a micro foundation DAG deduces his macro models. One is interlocked with the other. Microcosm is macrocosm and vice versa. All the while he leaves the viewer room to breathe and comprehend the details’ beauty. The wonder of mutation, the functionality of the optimal form. Minimal and compact. Frank Maier’s path to painting went via sculpture and is as such intrinsically determined by sculptural/physical issues. This is reflected not in the least by the fact that all pictorial works are in addition mounted on painted wooden boxes of a slightly smaller size than the respective pictures. Thus they seem on the one hand almost to float, yet at the same time accentuate their character as physical bodies, as containers. In his painting the line acquires decisive significance. Thread-like it spans the painted area, has a bearing to, connects, cuts and undercuts the geometric elements. For his pictorial fields Maier designs possible courses of the game which, however, never come down to any definite result but invent themselves as gliding constellations. Each picture is an echo of another picture and questions its own conditions. Exactly that.